In case you haven’t seen it yet, 60 minutes examined the rapid fall of the Knoedler Art Gallery in 2011. The piece does a thorough job of giving background on the Knoedler Gallery, the role of the Cataloge Raisonne, and scientific testing. Anderson Cooper: Do you feel you did enough due diligence as a buyer? Domenico de Sole: My due diligence was to go to the best, most prominent gallery in the United States dealing with a person with a stellar reputation, and pay a price that was reasonable, it was fair. Domenico de Sole was the person who bought that $8 million fake Mark Rothko and told us he believes Knoedler Gallery and its President Ann Freedman either knew or should have known that this lucrative collection could not possibly be genuine. Greg Clarick is his attorney. 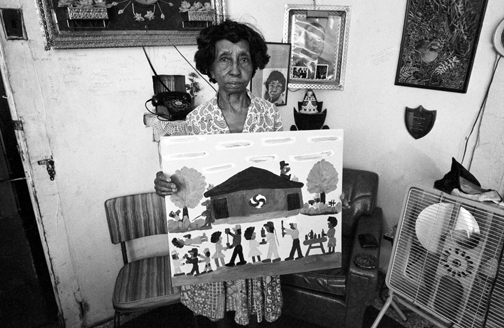 Greg Clarick: The red flags began with the notion that Glafira Rosales, who was an unknown person to Knoedler, who Knoedler never investigated, came in and she started delivering what turned out to be an endless stream of never-before-seen paintings was enough to raise a huge red flag. Greg Clarick: That’s right. Second, the works had no provenance. Anderson Cooper: No chain, no history? Greg Clarick: They had no history. They had no documents. Anderson Cooper: So there was no evidence these paintings had ever been painted by the artists? Not only that, there were no bills of sale, no insurance records, no shipping documents, and no museum exhibitions for any of the paintings. Greg Clarick told us the gallery had motivation to overlook the paintings’ shortcomings. Greg Clarick: Over the period of this fraud, Knoedler sold these paintings for about $67 million. 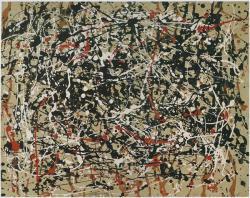 Knoedler made over $40 million in profit from selling these paintings. And at the same time, Knoedler made essentially no money at all from selling other paintings. The art dealer, Jose Carlos Bergantiños Diaz, who has been sought for many months, was arrested by the Spanish police on Friday at a luxury hotel in downtown Seville, according to the official, who is with the Spanish Interior Ministry in Madrid. He asked for anonymity because he was not authorized to speak publicly. Mr. Bergantiños’s brother, Jesus Angel Bergantiños Diaz, was also arrested, according to another person with knowledge of the case, who spoke on the condition of anonymity because no charges have been announced in the case. It was not immediately clear whether the United States will seek his extradition as well, but some $33 million netted from the scheme was transferred to bank accounts in his name in Spain. The Spanish Interior Ministry official said that Jose Carlos Bergantiños Diaz, who had an anxiety attack after his arrest and was briefly hospitalized, was being held by the police in Seville. But he is likely to be transferred to Madrid in the coming days, the official said, where he will appear before a judge pending an expected extradition request from the United States. By knowingly and falsely claiming that the Fake Works were painted by these famous artists, Jose Carlos Bergantinos Diaz, Jesus Angel Bergantinos Diaz, Qian, and Rosales were able to trick purchasers and prospective purchasers into paying tens of millions of dollars in total for many of the Fake Works which, as the defendants and Rosales well knew, were essentially worthless, as the defendants well knew, the Fake Works were created not by famous artists, but by Qian, with guidance from Jose Carlos Bergantinos Diaz, Jesus Angel Bergantinos Diaz, and Rosales. Jose Carlos Bergantinos Diaz, Jesus Angel Bergantinos Diaz, and Rosales also created and refined at least two false provenances (i.e., historical ownership records) for particular Fake Works in order to dupe purchasers into believing that those Fake Works were painted by particular famous artists, instead of by Qian. The defendants earned more than $33 million from the scheme to create and sell the Fake Works. To conceal the illegal nature and origin of the proceeds from the scheme, Jose Carlos Bergantinos Diaz and Jesus Angel Bergantinos Diaz, the defendants, and Rosales worked together to launder the proceeds by transferring the proceeds through foreign and domestic bank accounts that they controlled. In addition, as set forth below, to increase the amount of proceeds he kept from the unlawful scheme, Jose Carlos Bergantinos Diaz, the defendant, unlawfully impeded and obstructed the Internal Revenue Service (‘IRS’) by hiding millions of dollars in his unlawful income from the IRS and by knowingly failing to report the existence of the foreign bank accounts that he controlled or maintained an interest in, as required by law. You can fool some of the art market, but not the IRS. The tale of the Knoedler is a sad one, it was a storied gallery that had a hand in creating the collections of countless American art museums. I was reminded of this a couple weekends ago when we visited the MFA Houston’s special exhibition of John Singer Sargent, which brings together the Brooklyn and Boston collections of Sargent’s wartercolors. The Knoedler was able to sell one exhibition wholesale to Brooklyn in 1909 and then to Boston in 1912. One imagines the Knoedler was not using a serial forger in 1909, but it was this storied history which perhaps allowed buyers of art to avoid asking uncomfortable questions. If such a storied gallery can make so many egregious ethical and legal lapses, what about other galleries. How can we trust with absolute certainty the authenticity of any work? One may almost feel like Lord Byron in describing the Palace and Prison on each hand as he stood on the Bridge of Sighs. John Singer Sargent, The Bridge of Sighs, c. 1903–04, Brooklyn Museum. United States v. Diaz et al., 14 Crim217, Sealed Indictment (S.D.N.Y. 2014). Julia Halperin, Everything You Ever Wanted to Know About the Knoedler Forgery Debacle But Were Afraid to Ask, Artinfo (2011), http://www.blouinartinfo.com/news/story/753301/everything-you-ever-wanted-to-know-about-the-knoedler-forgery. William K. Rashbaum, Key Suspect in Art Scheme Is Under Arrest in Spain, N.Y. Times, April 20, 2014, http://www.nytimes.com/2014/04/21/nyregion/suspected-player-in-art-scams-is-arrested-in-spain.html?_r=0. This is not your typical April 1 prank. Curators at the University of Cincinnati have put together a super show “Faux Real” examining Mark Landis, the man who has fooled many medium and small museums into accepting donations of his forged works. 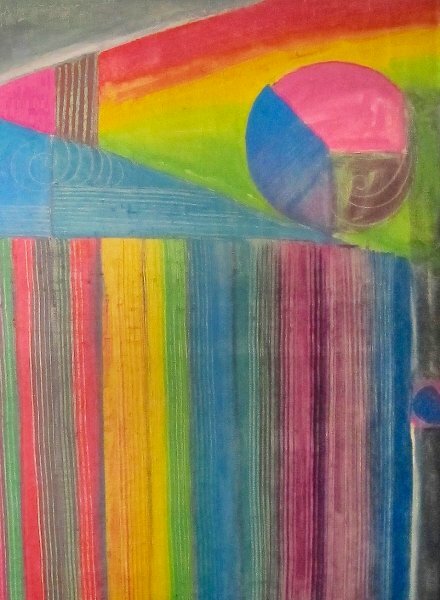 Landis creates works in oil, watercolor, pastels, chalk, ink and pencil, making most of his copies from museum or auction catalogs that provide dimensions and information on the originals. He sometimes bestows gifts under different names, such as the Father Arthur Scott alias used at Hilliard. In that case, he told officials that his dead mother had left works including Curran’s oil-on-wood painting “Three Women” and that he was donating it in her memory. . . . The Faux Real show will run through May 20 at the Dorothy W. and C. Lawson Reed Jr. Gallery. It depicts famous art forgers, details of how Landis made some donations and ways of detecting fakes. Visitors can view some works under ultraviolet light that causes sections to glow if they contain contemporary ingredients. Art experts say not accepting payment for his forgeries has helped keep Landis from being charged with a crime. Museum officials say forgeries can hurt their reputation and cost time and money researching suspected fraud. He presents a challenge for prosecutors and the small museums he donates the works to. But the attention paid to him now will hopefully prevent future museums from accepting more forgeries. The exhibition will run through May. ARCA offered advice with respect to the possible ways the law regulates (or to be more accurate has difficulty regulating) these forgeries and donations. Beltracchi and three accomplices were sentenced after just nine days at the Cologne District Court, with the defendants receiving shorter sentences in exchange for full confessions. But in a SPIEGEL interview the 61-year-old has now admitted to creating phoney works by “about 50” different artists. Speaking to the media for the first time since he was sentenced, Beltracchi refused to name the exact number of paintings he forged throughout his career, which he began in the 1970s by creating “unpainted works by old masters, and later Jugendstil and Expressionists” and selling them at flea markets. But during the interview with SPIEGEL, Beltracchi said that due to high demand, he could have easily put “1,000 or 2,000” forgeries on the art market. Ringleader Reveals He Faked Many More Works, Spiegel Online, March 5, 2012, http://www.spiegel.de/international/germany/0,1518,819409,00.html (last visited Mar 8, 2012). 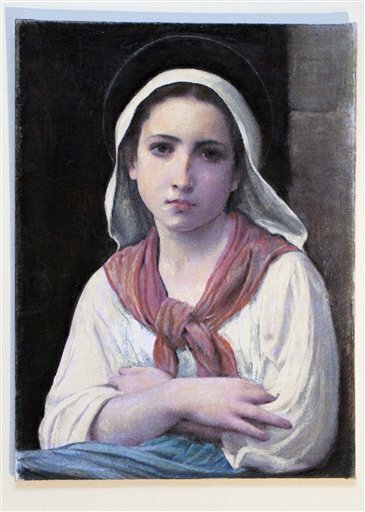 A work by Camille Pissarro, stolen from France in 1981 is on its way back after a United States forfeiture proceeding (previous discussion here). Princeton has announced the return of six antiquities with questionable histories to Italy. Maya remains and objects were discovered in Belize during a construction project. An investment art fraud scheme has been uncovered in Australia. Can nuclear physics determine whether a piece of art is genuine? Thieves have stolen 2 works of art from an Olympia, Washington art gallery by breaking and entering through a skylight. UNESCO has threatened to revoke world heritage status for Seville because of a decision to build a new 40-story building. Randy Kennedy has a super article (following an earlier report in the Art Newspaper) discussing a man named Mark Landis who forges works of art and donates the forgeries to art museums all over America. He may have been doing this for as many as twenty years. His real name is Mark A. Landis, and he is a lifelong painter and former gallery owner. But when he paid a visit to the Paul and Lulu Hilliard University Art Museum in Lafayette, La., last September, he seemed more like a character sprung from a Southern Gothic novel. He arrived in a big red Cadillac and introduced himself as Father Arthur Scott. Mark Tullos Jr., the museum’s director, remembers that he was dressed “in black slacks, a black jacket, a black shirt with the clerical collar and he was wearing a Jesuit pin on his lapel.” Partly because he was a man of the cloth and partly because he was bearing a generous gift — a small painting by the American Impressionist Charles Courtney Curran, which he said he wanted to donate in memory of his mother, a Lafayette native — it was difficult not to take him at his word, Mr. Tullos said. That is a pretty remarkable thing to do, even in the art trade. The lesson is clear though, we can certainly blame the forger/donor, but provenance and the history of an object must be checked, even when an object is donated. Randy Kennedy, Elusive Forger, Giving but Never Stealing, N.Y. Times (Jan. 12, 2011). Helen Stoilas, “Jesuit priest” donates fraudulent works, The Art Newspaper (Nov. 2010). The BBC and ANSA are reporting that a forged art ring has been discovered by authorities after an 18 month investigation. The investigation was conducted by monitoring payment transfers and consulting art historians. Works recovered include forgeries of works by Matisse and Magritte. There are more than 500 counterfeit works, which may have cost buyers close to 9 million euros. Italy seizes counterfeit artwork, BBC, August 25, 2010, http://www.bbc.co.uk/news/world-europe-11088475 (last visited Aug 25, 2010). "Maybe a Man’s Name Doesn’t Matter That Much"
So says Orson Welles in this clip from F for Fake. I couldn’t help but think of Welles and his film when reading Martin Gayford’s piece on the National Gallery in London’s new exhibition “Close Examination: Fakes, Mistakes and Discoveries”. The point of this story is not that art experts are foolish. In fact, the Faun is a very clever forgery. 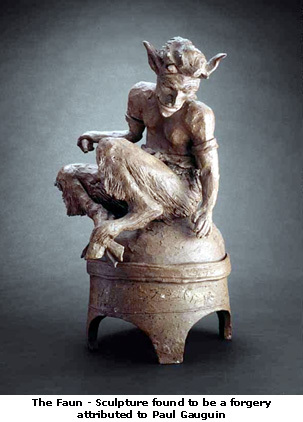 Its brilliance in part is that there actually was a Gauguin sculpture of a faun – it’s listed in an old inventory and may still exist in a cupboard somewhere. The lesson is that now we know it’s not a Gauguin, it ceases to be part of a larger whole: Gauguin’s art. At that point, even if it is still quite an attractive statuette, it loses an enormous amount of meaning. Discovering a work is a fake is like discovering a friend has been lying to you for years. It is difficult to separate the object from the deception. Even if the faun was a terrific work of aesthetic beauty, the fraud which spawned the forgery taints that beauty in our mind—we might even resent the object the better the “fake” really is. That is not to say it cannot be a beautiful object, but it loses something by trying to trick us. Artists play tricks all the time. The works of M.C. 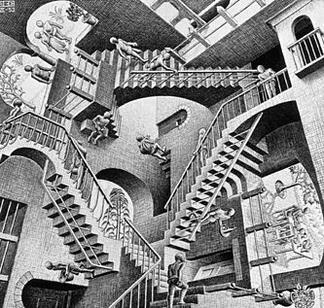 Escher may be the most obvious examle of this. But his deception is mathematical, and there for you to see—in a sense the job of the viewer is to try to figure out how he has done it. Orson Welles was right to ask what’s in a man’s name, and right to point out that it may not matter that much. But what does matter for something like the Faun and other forgeries is the lie told to the audience or the buyer. Art forgers may be the creator of the work, but also those who attempt to pass off works they know or should know are forged on an unsuspecting public. The bigger question is how many forgeries are exhibited in museums alongside the authentic works. When buyers and sellers and museums are not careful about the history of an object (including antiquities) we might think of them as a kind of forger as well. They may be unwitting, and fooled by a clever forger as the Art Institute of Chicago was, but when they value the object above everything, they risk becoming complicit in the forgery. Martin Gayford, Art forgeries: does it matter if you can’t spot an original?, Telegraph.co.uk, June 17, 2010, http://www.telegraph.co.uk/culture/art/art-features/7824999/Art-forgeries-does-it-matter-if-you-cant-spot-an-original.html (last visited Jun 18, 2010). Author Derek FinchamPosted on June 18, 2010 Categories UncategorizedTags Bolton Forgers, Fakes, Forgery, The National Gallery (London)2 Comments on "Maybe a Man’s Name Doesn’t Matter That Much"